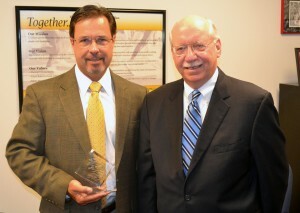 Didlake Vice President of Contract Operations Mike Payne (left) holds the 2011 National Council of Work Centers (NCWC) Management Excellence Award. He is pictured beside Didlake President and CEO Rex Parr. Manassas, VA – Didlake Vice President of Contract Operations Mike Payne received the 2011 National Council of Work Centers (NCWC) Management Excellence Award for the East Region at the 2012 NISH National Training and Achievement Conference in Indianapolis. “I was honored to be nominated by Didlake President and CEO Rex Parr and my co-workers, and humbled to be selected by my peers as the recipient of this esteemed award,” Payne said. The NCWC is an independent network of executives representing more than 550 Community Rehabilitation Programs (CRPs) throughout the United States, which provide employment for people with significant disabilities through the AbilityOne program. The NCWC network constitutes the nation’s largest employer of people with disabilities, providing over 120,000 jobs for people with significant disabilities.